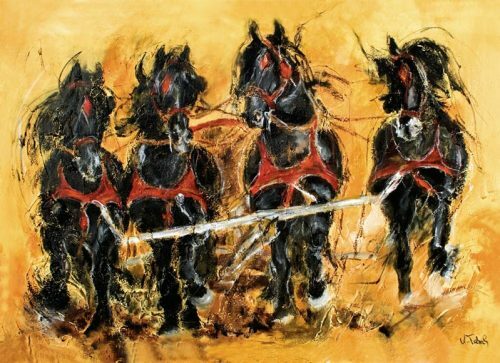 As one, two or four horses harnessed in front of a cariage, driving horses have to prove their strength and coordination ability in various disciplines. In order to meet these demands, a strong stature and a portion of nerve strength are particularly in demand with these horses. 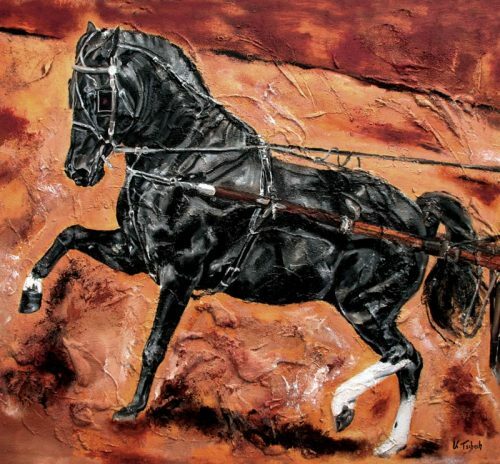 Therefore the first choice in driving sport is a strong Crossbred Horse, like the Oldenburger or the Holsteiner, while a heavy warm blood like the Barock Pinto is often used for show driving. In addition to the powerful depiction of the driving horses, the artist attaches great importance to the effect of the details, such as the harness and the carriage itself, in order to illustrate the full splendour of the carriage team. One of her large-format carriage paintings, for example, can be seen in Mr. Tesch’s unique carriage museum. 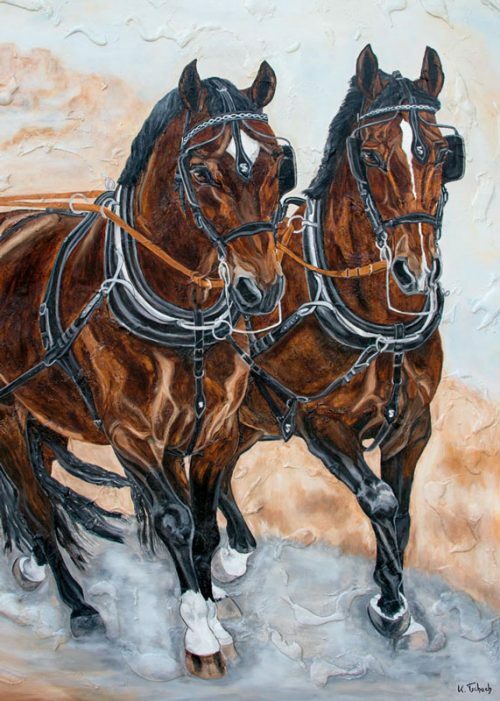 Also here in the Horse Art Online-Shop you will find an excerpt of this Original as an art print with two carriage horses. In driving sport, the team of horses must compete with their opponents in the three sub-disciplines of dressage, cross-country and obstacle driving. As an internationally renowned tournament, the CHIO Aachen has been providing a further sub-discipline with the marathon run since 2006. In Germany, people drive according to the Achenbach drivingsystem, which goes back to Benno von Achenbach, who is regarded as a pioneer of driving. In addition to sport, the driving horses can also be found in the leisure area during traditional carriage rides, in front of the wedding carriage or in the show area, where often two to three horses are harnessed in a row as a random or tandem and in a troika or quadriga inspire the spectators.